No one is going to argue that you can have a mindful practice while watching TV. Any true meaning within a practice would get drowned out by the running episode of Marco Polo. But if you’re going to just spend the night vegging out anyway, it doesn’t hurt to relax into some poses that may help release the body and deepen your in class practice. And though it may never pass for a 'true' practice, it may be just the thing you need to settle the body in for the night while taking in your favorite show. Here are some yoga poses you can do even as you sit on your couch and watch TV. 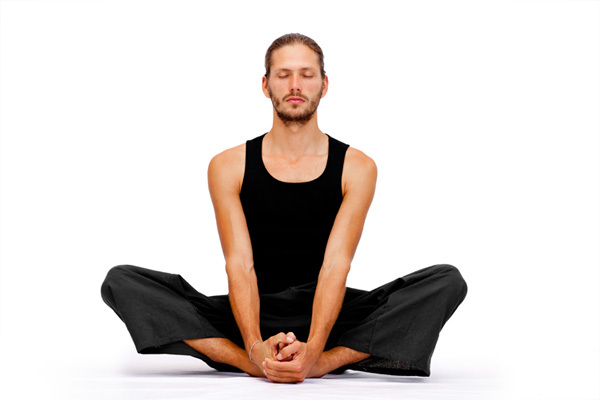 Sit cross-legged, spine long and shoulders dropped. Easy pose can open hips and release quads. The trick here is to remember to change the cross of the legs periodically. This change how the sit bones press into the mat, floor, blanket, or rug. Connect sit bones to mat or floor and open feet wide. Spine is long and you can try variations such as sitting more upright and then try lowering the chest to the floor. Other things to try are flexing and then pointing toes, engaging and then releasing quads. For a hamstring release try placing blocks (or pillows) under each thigh. Sit with soles of feet together, knees opening only as far as they go. Hands can connect to feet, rest on knees or interlace with the toes. Another hefty hip opener, Baddha Konasana can be made more relaxed by placing blocks, blankets or pillows for less stretch and more release. Lie on your back and draw the knees into the chest. Use the belly to lower the knees to one side letting them release into the floor or a blanket. Spread the arms wide (you’ll look like a big “T” from above) and send the eyes in the opposite direction of the feet. Switch sides. Try variations like extending the legs rather than keeping them bent, or crossing one bent knee over to the opposite side. Play with the variations — there is almost as many as there are new releases on Netflix. Edge one hip close to the wall. In one movement, swing your legs up the wall and your shoulders lightly to the floor. If it feels uncomfortable, you can use a bolster or folded up blankets for support under the hips or on the lower back. Legs can be straight up the wall or opened wider. Any other favorite poses (or TV programs) that help you relax?